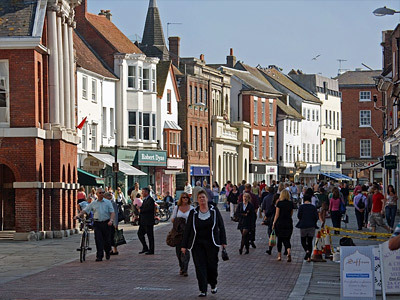 Chichester is located in the wooded South Downs, one of the most attractive areas of Britain, where glorious stretches of quintessential English countryside roll almost to the edge of the city. Hidden in its folds are, tiny villages of thatched cottages, half-timbered houses and ancient churches. To the south lies a wide coastal plain reaching down to the sea. To the south west lies Chichester Harbour, a yachtsman's delight, with over 27 square miles of navigable water. The development of the extensive yacht basin at nearby Birdham has made Chichester one of the busiest yachting centres in the British Isles. The town was founded by the Romans in the 1st century AD, then known as Noviomagus (the new city of the plain), it is now one of Britain's oldest towns. 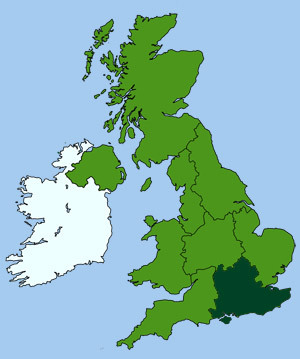 The Romans used Chichester as a base camp when they first arrived in Britain, but later it was laid out as a market town and administrative centre. Today its four main streets still follow the lines of the original Roman street plan. The original city walls were built in about AD 200, with gates at the end of each main street, North, South, West and East. Large stretches of the walls are still visible, but have been so altered over the centuries that most of what remains is now medieval. Much of the city's architecture is Georgian, and there are some beautiful merchants' houses in West Street and the Pallants. The market cross, which stands at the city centre, was the gift of Bishop Edward Story in 1501. It is 50 ft high and one of the finest in England. Opened in 1962 just outside the old city walls, it provides the focal point of the annual Chichester Festival. It is a modem building of hexagonal design with a traditional apron stage. Sir Laurence Olivier was the theatre's first artistic director, and its presentation of classical and contemporary theatre over the years, has won it an international reputation. Permanent exhibits include Archaeology, Victorian and Georgian Life plus Ethnic and Local History. Located in the lovely setting of Priory Park, it was built during the 1270s by Franciscans in the design of a church. In the past it has played a central role in the government of Chichester. Most notably in the trial of the mystic poet and artist William Blake, who was tried there for treason. Today it is mainly used as a backdrop for wedding photographs. It houses some of the Chichester District Museum's collection but it is very rarely open to the public. With a soaring nave and a graceful spire of some 277 ft (85 m) high, it is the only English cathedral to be clearly visible at sea. Work on the Cathedral started in 1091 by Bishop Ralph de Luffa on the site of an old collegiate church. The separate bell-tower, near the north porch, was built later in the 15th century. It was desecrated by the Puritans, twice damaged by fire, and its spire completely collapsed in a gale in the 1860s. However, the cathedral has actually survived very well and remains substantially the same as it was when built in the 12th and 13th centuries. The cathedral's contemporary	altar tapestry was designed by John Piper in 1966. Located in the Sailors' Chapel is the pennant flown by Sir Francis Chichester on his epic solo voyage around the world in Gipsy Moth IV in 1966-7. There are two unusual monuments inside the cathedral. One is a statue of William Huskisson MP, the world's first railway fatality. The other is the tomb of the Earl of Arundel (died 1376) and his countess, whose stone effigies lie side by side holding hands. This scene inspired Philip Larkin to write a delightful poem. It is possible to walk around much of Chichester's city walls, the best places to see them are in Priory Park, Jubilee Park and the Bishops Palace Gardens. Located in the centre of the city, this opulent Queen Anne style townhouse was built by a wealthy wine-merchant, Henry Peckham, in the early 18th century. Restored in the 20th century it is now an art gallery, hosting an array of paintings commissioned and collected by Walter Hussey, the Dean of Chichester.